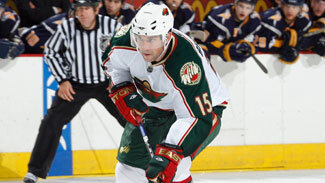 Wild forward Andrew Brunette hasn't missed a game since Dec. 31, 2001. For those keeping track, that's 499 straight games -- the longest active streak in the NHL. But Brunette's streak was jeopardized this week when he suffered a knee injury in a game against the Ducks. It was touch and go, but Brunette gutted out games Monday against the Blackhawks and Tuesday against the Kings. "I'm going to try as hard as I can," Brunette, 35, told the Minneapolis Star Tribune before Monday's game. "If I can get in the lineup, I'm going to play." That he did, and then he played again 24 hours later. Brunette recorded 3 assists in the back-to-back games. He'll have a week to get better; the Wild don't play again until Jan. 27, when they host the Maple Leafs. So far, the Canucks' splashy signing of free-agent center Mats Sundin hasn't exactly paid dividends for Vancouver. The return to health of star goalie Roberto Luongo hasn't proven to be a big benefit yet, either. After winning Sundin's debut, 4-2, at Edmonton on Jan. 7, the Canucks hit the All-Star break on an 0-4-2 streak, capped by Tuesday's 2-1 overtime loss at San Jose. In the first five games of the skid, the Canucks had allowed four or more goals in each game. "We have all the players here to be a playoff team and be a good team that can go far in the playoffs," Sundin told the Vancouver Province following Sunday's 6-5 shootout loss to the Blue Jackets. "But we all have to help keep the puck out of our net. If we play good team defense, we have players who can score. But we have to play better defensively than we did tonight." The Canucks open a three-game homestand after the break, but that might not be much help -- the first five games of their current slide were at GM Place and they've lost seven straight at home. "Our defensive breakdowns are due to one component -- our puck management," Canucks coach Alain Vigneault told the newspaper. "Our decisions with the puck are putting us in trouble, whether it's the defense or forwards not making the right decision." On the positive side, the Canucks played a very solid road game against the Sharks on Tuesday. They clogged the middle of the ice and limited the Sharks' opportunities. But they could not quite hang on. Clinging to a 1-0 lead in the final minute of regulation, the Canucks allowed the tying goal to San Jose’s Devin Setoguchi. In overtime, they allowed a power-play goal to Patrick Marleau with Daniel Sedin in the penalty box. Still, it might have been a start for the Canucks. But they are going to have some work to do once the All-Star break is over. Old hero, new hero -- The Oilers honored former star forward Glenn Anderson on Sunday night, retiring his No. 9. Anderson was a key cog in the Oilers' Stanley Cup championship teams two decades ago. After the ceremony, captain Ethan Moreau had a hat trick in a 6-3 victory against the Coyotes. It was Moreau's first NHL hat trick, in his 754th NHL game. 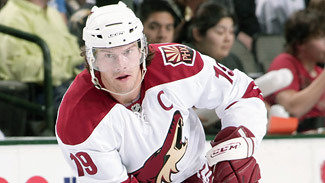 Phoenix captain Shane Doan is the last Coyote with ties to Winnipeg; Lemieux called up to Sharks. Moreau is the second player in the past month with a lengthy tenure in the League to finally record his first hat trick. In December, the Penguins' Petr Sykora notched his first three-goal game; he'll appear in his 900th NHL game next month. Moreau scored his third goal of the night into an empty net off a pass from defenseman Steve Staios. Afterward, Moreau praised Staios for his unselfishness. "I knew when Steve got the puck he'd be thinking of one thing and that was to get it to me," Moreau told the Edmonton Journal. "It's a weird feeling, though, when everyone on the ice is looking for you. It adds a little bit of pressure but it just shows the camaraderie we have on our team. A lot of guys would get the puck and just try and score. That's a credit to the team we've built here." Moreau sounded as if he enjoyed the ceremony for Anderson almost as much as the three-goal game. "That's one of the special things about playing in this city," Moreau said. "You get to see those (legends). … I've been here for every one of the (jersey retirements) and I love seeing them. I love that bridge from the present and the past. I do think I went to the net hard because I saw Andy in all those highlights. Hopefully, we played a little bit like him." Ales Hemsky, who returned after a 10-game absence due to a concussion, had a pair of goals in the win against Phoenix, and followed that two nights later with 2 goals and 2 assists in Tuesday's 4-3 defeat of Columbus as the Oilers hit the All-Star break with four wins in five games. Big letdown -- You had to figure the Flames were ripe for a big comedown. Heading into Saturday's home game against the Coyotes, Calgary had won nine of 10 games, but that wasn't even the impressive part. The impressive part was two regulation victories against the Sharks in a nine-day span, especially when you consider that before those games, the Sharks had lost only four games in regulation all season. The second of those wins was in San Jose -- the Sharks’ first regulation home loss this season. "We want to keep climbing, moving up," Flames captain Jarome Iginla told reporters. "We want to get to the next tier." Despite two straight losses heading into Wednesday's game against Columbus, who's going to argue against the possibility that the Flames already are there? Though their point total trails conference pace-setters San Jose and Detroit, the Flames have been about as hot as any team in the last couple of months. They caught fire following a 6-1 loss at San Jose in November. "We've improved so much since that game," Flames coach Mike Keenan said. The 300 club -- Goals have been hard to come by for the Avalanche this season, but Sunday, they scored 600 of them. OK, that's exaggerating, but teammates Ryan Smyth and Milan Hejduk each scored their 300th career goals 4:44 apart in the second period of a 6-2 rout of the Flames. It marked the first time in nearly 26 years that teammates scored their 300th goals back-to-back in the same period. The answer to the trivia question is Danny Gare and Ivan Boldirev, who accomplished the feat for the Red Wings on Feb. 26, 1983. "I've been here for every one of the (jersey retirements) and I love seeing them. I love that bridge from the present and the past. I do think I went to the net hard because I saw Andy in all those highlights. Hopefully, we played a little bit like him." "When we were both at about 298 together, we joked that we should both get the 300th on the same night," Hejduk told the Denver Post. "It's pretty good the way it happened, one right after the other like that. It was a fun period." Smyth said, "It's obviously a special goal for me personally. But it was also important to help get us two needed points." It took Hejduk 747 NHL games to get to 300, and the Avalanche are the only team he has played for. It took 889 games for Smyth, who spent most of his career with the Oilers and also played for the Islanders. Exactly one-tenth of Smyth's first 300 goals came with Colorado. "It was a good win and it was a special night for Ryan and Milan," Avalanche coach Tony Granato told the Post. "They should feel very excited and proud to have done it, and doing it on the same night makes it even more special."